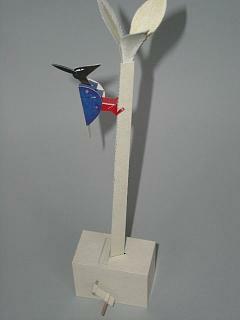 The Woodpecker belongs to the 7 models in Spooner's "Moving Animals". A woodpecker with Anubis' head pecks busily at a palm which wobbles violently. In the model the palm is shaken to and fro by a pentagonal cam and transfers the movement to the woodpecker.